Expectations: Low. The boring pace of End of the World leaves a bad taste in my mouth. 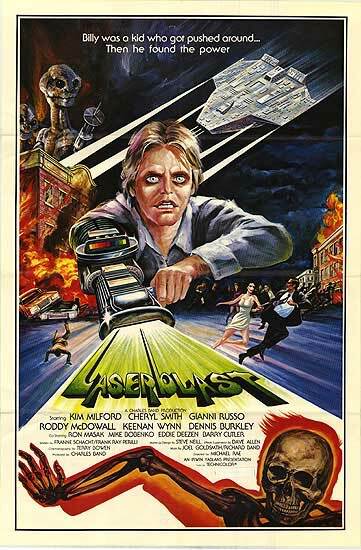 Laserblast reportedly had a budget of $280,000, and producer Charles Band knew just where to spend it. Virtually every penny was sunk straight into entertainment and a finale that delivers slow-motion explosion after slow-motion explosion, further proving that the worth of a movie can exist on explosions alone. 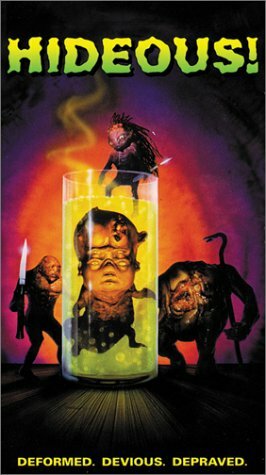 Add in some killer stop-motion aliens and a giant laserblaster as cherries on top and we’ve got ourselves a movie! Laserblast opens as a crazed freak with a giant laserblaster on his arm jumps around in the desert. An alien ship lands and two upright-walking turtles without shells get out and pull their own, smaller laser guns. A short fight ensues, but the aliens are too clever and end up singeing the dude into fine black ash. They board their ship and set out for the far-reaches of the galaxy, but they forgot one thing. The human’s giant laserblaster! When we left Jack Deth in Trancers 4, he had just vanquished the Trancer leader, Lord Caliban. All was set right in the alternate dimension of Orpheus and Jack could sit back knowing he saved not only his own dimension, but his new one as well. 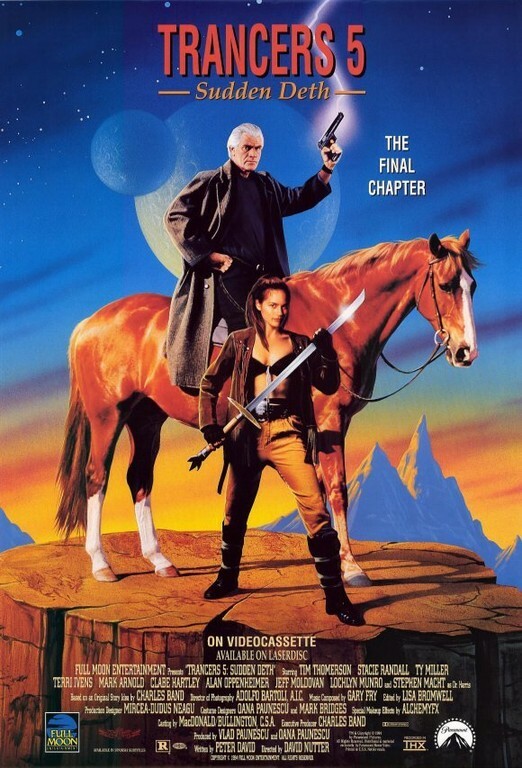 Trancers 5 informs new viewers of the previous events with a quick retelling featuring hilarious narration. 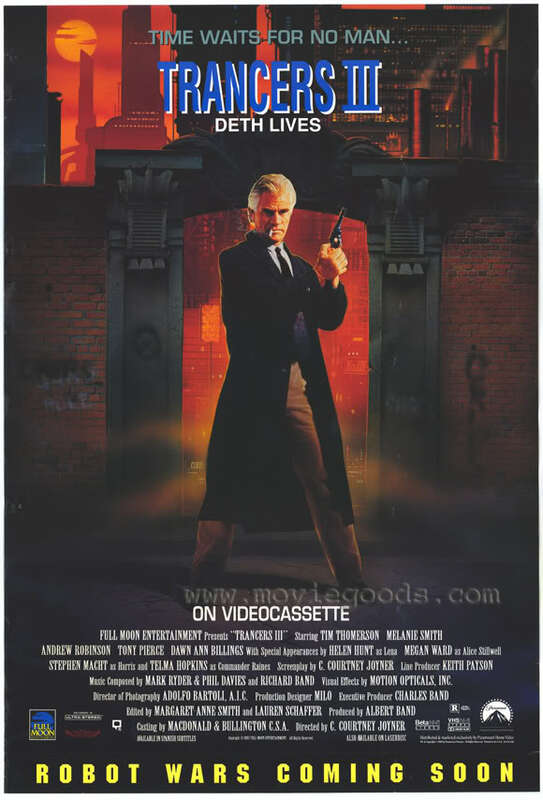 At the culmination of this, the screen literally rips apart and Trancers 5 begins in earnest with the Tunnel Rats’ action-packed, swashbuckling assault on Caliban’s castle. Damn! That’s the way you start a movie! Expectations: High. 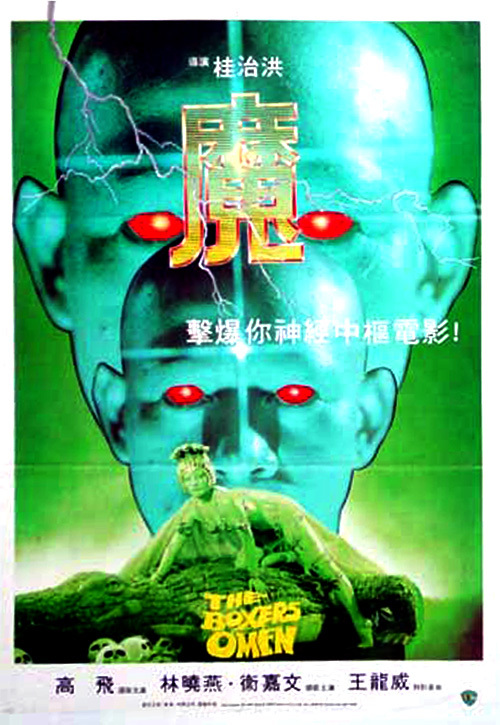 With a name like Hell Comes to Frogtown, it has to be good. The term cult classic gets thrown around a lot, but more often than not, the films referenced just don’t deserve the moniker. 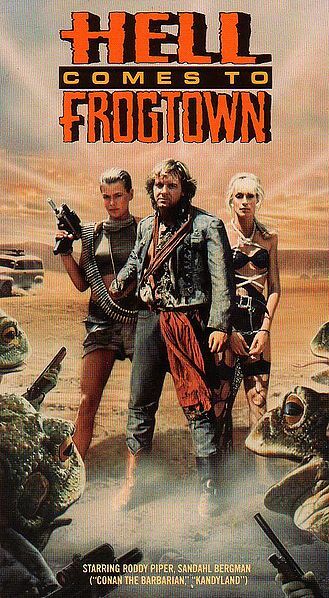 Hell Comes to Frogtown however, is a true cult classic. Starring Rowdy Roddy Piper and Valeria from Conan the Barbarian, Sandahl Bergman, the film plays out like a wild, testosterone-fueled, post-apocalyptic male fantasy. 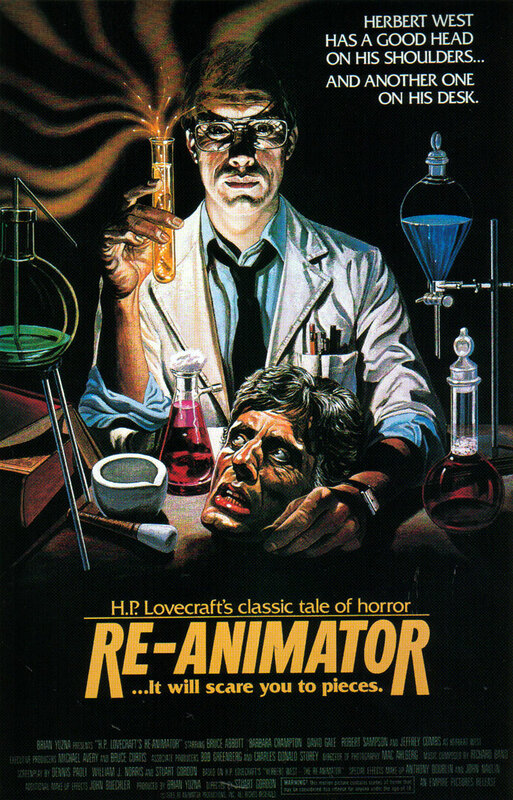 It never betrays its B-movie roots or pretends to be something other than super-fun trash. Instead, directors Donald G. Jackson and R.J. Kizer put the pedal to the metal and go full-bore into the oblivion of Frogtown. Roddy Piper plays Sam Hell, a man with a high sperm count in a very infertile world. 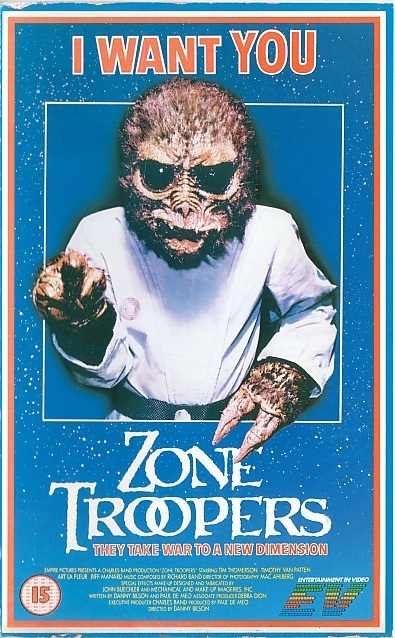 The governmental department Med-Tech places a C4-laced chastity belt on Hell and contracts him to enter Frogtown and save a group of nubile women taken hostage by the Frog leader, Commander Toty (pronounced Toady…get it? He’s a frog!). Along for the ride are Spangle (Sandahl Bergman) and Centinella (Cec Verrell), a pair of Med-Tech operatives tasked with keeping Sam Hell safe and ready to procreate. Expectations: Moderate. 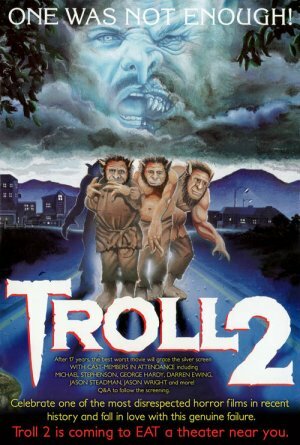 The 2nd was OK.
Jack Deth has stooped to new lows. As the film starts, Deth advertises his private investigation business focused on cheating husbands with a low-budget television commercial featuring a bevy of cute girls in Santa’s Helpers costumes and a VHS video camera in hand. The end of the ad is punctuated with a shotgun blast to the TV from a disgruntled liquor store robber. He runs back to the counter trying to get the money from the prerequisite Asian store owner, when suddenly a high-pitched squeal hurts their ears. They are bathed in orange light and a time capsule that kinda looks like a phone booth materializes. A crazy looking alien thing pops out and asks, “Where’s Jack Deth?” The alien promptly tracks Jack down and takes him back to the future with him. Oh no!